All of us at West Ballantyne Animal Hospital want to congratulate you on your new kitten! Although welcoming a new kitten into your home is an exciting time, it can also bring up many questions and concerns. West Charlotte veterinarian Dr. Linfante and his staff are here to help answer your questions and provide the best veterinary care to help your kitten grow up healthy and strong. 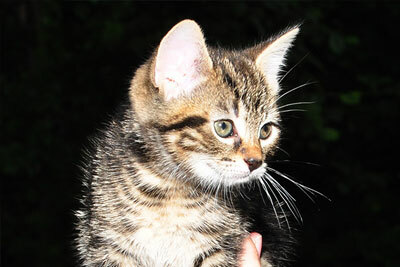 A kitten’s immune system is still in development which makes them more vulnerable to illness. This is why it’s important for your kitten to have their first preventive exam as soon as possible. Our veterinarian will create a tailored cat vaccination schedule that will address your kitten’s needs and lifestyle. We do NOT believe in over vaccination and will choose only those vaccines that your kitten actually needs. This method will protect your new kitten from any diseases he or she is likely to be exposed to. There are many diseases that are preventable through the judicious use of vaccines, so it is important to create an individualized protocol early in life to protect both your kitten and your family. We take special interest in our cat vaccinations – every kitten owner should read our feline vaccination page regarding the specific vaccines we use. Just as vaccines protect your pet from disease and illness, microchips help keep your kitten safe if they are lost or stolen. The unique identifier in your pet’s microchip will help bring them home safely, providing shelters and animal hospitals with your contact information to reunite you with your pet. In preparation for your kitten’s first visit with us, it is helpful to bring the health information provided to you by the seller or shelter, as well as a fresh stool sample. For the safety of your kitten, please bring them in a secure carrier. Contact us today to schedule an appointment for your kitten’s preventive care exam.